The Bureau of Economic Analysis (BEA) released the advance estimate of real GDP growth for the fourth quarter of 2012. 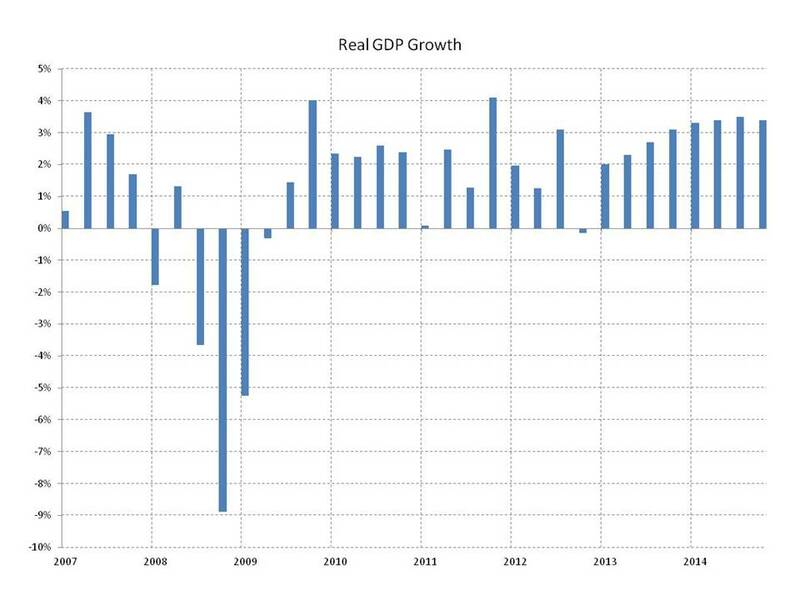 Economic output, as reflected by real GDP growth, shrank at a seasonally adjusted annual rate of 0.1%. Most analysts expected growth to slow from the third quarter pace of 3.1% but the negative growth figure, while slight, was a surprise. The main contributors to the contraction were national defense spending and inventory investment, each shaving roughly 1.3 percentage points from growth. Declining exports trimmed an additional 0.3 percentage points from growth. On the positive side, accelerating personal consumption expenditures (PCE), business investment in equipment and software, and residential fixed investment (RFI) partially offset the declines. The BEA cautions that the advance estimate is subject to revision (twice) noting that on average the final estimate has been 0.6 percentage points higher or lower than the initial estimate. A final estimate in the range of 0.5% to 1.0% growth would be in line with forecasters’ prior expectations for the fourth quarter. Looking forward, past the revisions and on to growth in 2013, the weaker than expected fourth quarter growth doesn’t necessarily signal continuing weakness. The large decline in defense spending this quarter followed a surge in the third quarter and is unlikely to be repeated early in 2013. Similarly, the slowdown in inventory investment is likely to be reversed rather than repeated in coming quarters. On the other hand, the acceleration in PCE this quarter may be weakened going forward as the payroll tax reverts to the pre-stimulus package rate of 6.2% and households adjust to smaller take-home pay. Similarly, the contribution to growth from business investment in equipment and software this quarter may have been inflated by expectations of the expiration of tax preferences and a rush to get in ahead of the end of the year deadline. The pace of investment is likely to slow in spite of the extension of these preferences, a component of the deal negotiated to avoid the fiscal cliff. RFI is expected to continue its strong growth and positive contributions to GDP growth of the last five quarters as the housing recovery continues and gains momentum in 2013. RFI’s return to positive contributions to GDP growth should provide the additional boost that has been missing until recently in the recovery and bring overall economic growth to more robust levels in 2013 and beyond.